An exciting sequel to the Captain Nemo adventures enjoyed by millions in Jules Verne's 20,000 Leagues Under the Sea.... Sea monsters are sinking ships up and down the Atlantic Coast. Enraged that his navy is helpless against this onslaught and facing a possible World War as a result, President Ulysses S. Grant is forced to ask for assistance from the notorious Captain Nemo, in Federal prison for war crimes and scheduled for execution. I’ve got a lot of mixed feelings about NEMO RISING. I enjoyed the whole story, but when I sat down to write this review and really started thinking about it, I realized that I gave the book too much slack because of my love of 20,000 LEAGUES. If NEMO RISING wasn’t about Captain Nemo and the Nautilus, but about some other random submarine post Civil War I would not have liked it anywhere near as much. I enjoyed the nostalgia of NEMO RISING. I’ve always been a big fan of 20,000 LEAGUES. I grew up watching the old Disney movie, and have read the book a couple of times. Joyner does a good job of capturing Nemo’s spirit, but there was often too much tell instead of show. 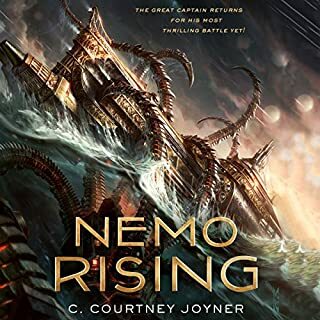 If you aren’t familiar with Nemo and the Nautilus then some of the story might be confusing, because Joyner writes NEMO RISING assuming your familiar with 20,000 LEAGUES. Joyner also really kicks up the violence way beyond what Verne would ever have done. But the discovery and exploration that was key to 20,000 LEAGUES is still present in NEMO RISING. My favorite part of NEMO RISING is the lack of over explaining for having Sarah be an important part of the story. So many historical fiction novels spend forever coming up with reasons to have a female character. Sarah was never treated any differently, she was just naturally part of the story, and it was a nice change of pace. If you are a fan of 20,000 LEAGUES than I’d recommend giving NEMO RISING a try. If you've never read 20,000 LEAGUES UNDER THE SEA then I highly recommend you give that one a try, Jules Verne was a genius who predicted many technological advances. Sage is eighteen, down on her luck, and struggling to survive on the streets of Los Angeles. Everything changes the night she's invited to a party - one that turns out to be a trap. Thrust into a magical world hidden within the City of Angels, Sage discovers that she's the daughter of a Celtic goddess, with powers that are only in their infancy. Now that she is of age, she's asked to pledge her service to one of the five deities, all keen on winning her favor by any means possible. 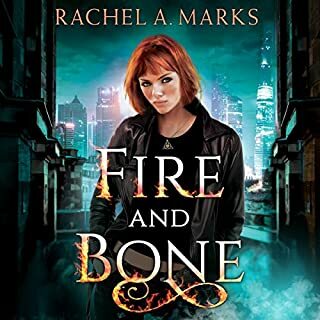 FIRE AND BONE is a refreshing addition to the Urban Fantasy genre. Greek and Roman mythology have been way over done, Norse mythology is starting to get to that point, but there are so few stories about Celtic mythology out there. FIRE AND BONE does a great job weaving the Celtic mythos into an excellent story. I love diving into new series, but I’m always wary of the dreaded info dump. There weren’t any in FIRE AND BONE! Rachel Marks has created a rich world and great characters all built around Celtic mythos without having pages and pages of info dumps. All the information about the world is provided beautifully and seamlessly. My biggest complaint with FIRE AND BONE is the love triangle. Not a fan of love triangle stories in the slightest. However, the synopsis made it very clear there was a love triangle so I knew what I was getting into and didn’t let that get in the way of a great story. Sage also handles the love triangle well. She doesn't spend every waking moment moping over which boy to chose. She worries about her real problems, while any relationship is clearly secondary. The end of FIRE AND BONE had a great plot twist, but it’s going to make the love triangle even worse for the future books in the Otherborn series. FIRE AND BONE is an amazing book that I highly recommend. I listened to the whole book in a day and I wish I could already move on to the next book in the Otherborn series. The mix of Celtic mythology and a beautifully built world with great characters were definitely spawn a great series. Best Boundary Magic book so far! I’ve been looking forward to BOUNDARY BORN since I finished BOUNDARY LINES last year. And BOUNDARY BORN was easily worth the wait. The Boundary Magic series has gotten significantly better with each book, and BOUNDARY BORN has continued that tradition by bringing us another epic adventure. Lex has become one of my favorite urban fantasy heroines. She has her doubts and struggles. But Lex isn’t whiny like some heroines can get. She’s died multiple times, her twin sister was killed by werewolves before she even knew about the Old World, and she has PTSD from her time in the Army. Those are just a few of her issues but she doesn’t moan about how the world is out to get her, she just gets up and fights back. 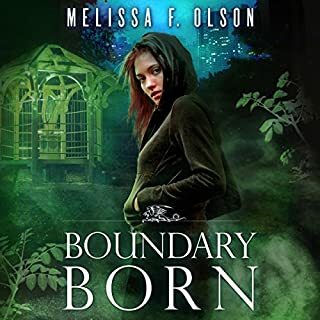 There isn’t really any romance in BOUNDARY BORN, which I was fine with, but if that’s what you’re looking for it isn’t here. Lex is in a healthy relationship, with an actually decent guy (something I rarely find in female led urban fantasy/paranormal romance.) Quinn doesn’t try to keep Lex locked up despite that fact that she’s clearly capable of holding her own in a fight, and he’s even honest with Lex and tells her about his not so pleasant past. And Lex doesn’t see the need to mention every other page how hot Quinn is. It is clear that their relationship is much more than the abusive and lustful relationships of paranormal romance. Another thing that Melissa Olson does spectacularly is having injured characters. In the last Scarlett Bernard book, Scarlett had to use a crutch the whole time. In BOUNDARY BORN Lex gets injured and has to deal with those effects. It makes sense that vampire and werewolf characters heal fast, but sometimes it's fun to see the characters actually have consequences for the actions they take. BOUNDARY BORN is an amazing book. I’ll miss Lex as Melissa Olson returns to the Scarlett Bernard series. But there are still adventures for Lex so I’m certain that Olson will return to the Boundary Magic series again. I'm sorry if I'm starting to sound like a broken record, but I want to start this review off by once again complimenting the amazing artwork of Doris Mantair. 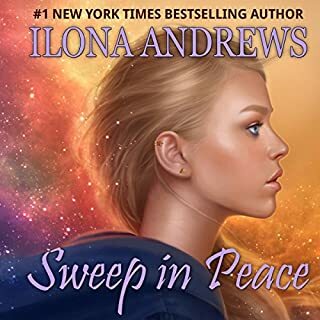 And along with the fantastic cover art Ilona Andrews also commissioned another four pieces of art that are scattered throughout SWEEP IN PEACE. I really wish that more books did that. It's easier to do now that so many people read ebooks, and it brings the story to life a little bit more. Though Ilona Andrews really doesn't need any help bringing the story to life. Part of what made CLEAN SWEEP a 5 bat book was the unique idea behind the Innkeeper Chronicles. I was a little worried that part of that wonder would've worn off by SWEEP IN PEACE, but that wasn't the case for me. Ilona Andrews continues to add to the world of the Innkeeper Chronicles and keeps the world alive and vibrant. In CLEAN SWEEP there was a lot of action and fighting since Dina, Sean, and Arland were trying to take down an assassin. However, SWEEP IN PEACE has almost no action or fighting. I love when an author can switch things up like that and still make the book amazing, but some people won't like it. SWEEP IN PEACE is all about court intrigue and politics, because Dina is hosting a peace summit at Gertrude Hunt. Ilona Andrews is constantly keeping you guessing and the pace is still fast and intense, just different from CLEAN SWEEP. I also loved the romance that was in SWEEP IN PEACE. Now a lot of people will read SWEEP IN PEACE and say that there isn't any romance, and that's because there isn't a ton of interaction between Dina and Sean or Dina and Arland. However, there is a lot of character growth and development related to these romantic relationships. I've always preferred books where an author can pull off an amazing slow burn of a relationship rather than an instant scorching fire. Those relationships are the ones that I get more connected to and invested in because they're more realistic and believable. Finally, for those of you who read The Edge series, you'll get to see some of your favorite characters again. In CLEAN SWEEP there was just a minor mention of two characters from The Edge, but in SWEEP IN PEACE George, Jack, Gaston, and Lark all play large roles in the story. Don't worry if you haven't read The Edge you won't be confused by anything in SWEEP IN PEACE, but I also highly recommend reading The Edge series if you haven't. SWEEP IN PEACE is an excellent second installment in the Innkeeper Chronicles, and I can't wait to see what Dina has in store for her next! Following the discoveries made by Cormac in Low Midnight, Kitty and her allies are ready to strike. But when their assassination attempt on the evil vampire Dux Bellorum fails, Kitty finds herself running out of time. The elusive vampire lord has begun his apocalyptic end game, and Kitty still doesn't know where he will strike. Meanwhile, pressure mounts in Denver, as Kitty and her pack begin to experience the true reach of Dux Bellorum's cult. It's always a bittersweet affair when one of your favorite series comes to a close. I've been listening to the Kitty Norville series for the past three years, so I haven't been following the series since its inception, but it still feels like it's over too soon. That being said I was worried when Carrie Vaughn introduced the idea of "the long game" that the series would start to drag or become repetitive. I did not ever find that too be the case, and I feel that KITTY SAVES THE WORLD is the perfect ending to such an amazing series. I'm amazed at how well Carrie Vaughn put together the final book in the Kitty Norville series. There were so many things that I wanted to see happen, and I'm pretty sure that all of them happened. The book starts out where Kitty has always belonged, behind the microphone on her talk show. Kitty's talk shows have always been a highlight of every book for me. I was so fascinated with the original idea of a werewolf talk show host, and that was why I loved the first book, Kitty and the Midnight Hour, so much. If you had a favorite character in the series, that hadn't died, than you're almost guaranteed to see that character in KITTY SAVES THE WORLD. For me Kitty Norville has always been about the characters, watching them grow and seeing new ones come into play. So I was worried that some of my favorite characters wouldn't get an appearance in the last book, just because there were so many characters in this series. 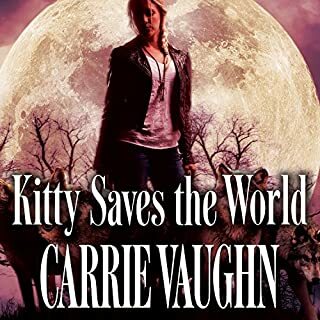 Carrie Vaughn did an great job of bringing all the characters back together and giving them all important roles to help Kitty stop Roman and the apocalypse. I could go on for many paragraphs about this book. I'm often disappointed with the final book of a series. There are so many things that I want to see and so many plots to tie up, most authors just don't do it that well. Carrie Vaughn wrapped up all the major plot lines and pulled everything together in the end. KITTY SAVES THE WORLD is probably my favorite final book in any series that I've read. I highly recommend KITTY SAVES THE WORLD. Notes on the Audiobook: Though I did receive and ARC copy of KITTY SAVES THE WORLD. I still had to listen to it as well when the audiobook came out. I've listened to every other Kitty book so I couldn't not listen to the last one. Marguerite Gavin does an amazing job with these series, and her voice will always be Kitty's in my mind. The only thing that could make the audio better is if they actually played Bad Moon Rising before the Midnight Hour. If I could give this book a six bat rating I would. THE AERONAUT'S WINDLASS more than deserves it. Jim Butcher's Dresden Files are what first got me interested in Urban Fantasy, but I haven't yet tried Jim Butcher's Codex Alera series, so THE AERONAUT'S WINDLASS is the first book of Butcher's besides the Dresden Files that I've read. And at every page I was reminded why Jim Butcher is a grand master in his field. The first thing about THE AERONAUT'S WINDLASS that stood out to me was how well Butcher handled multiple POV characters. In the past year especially, I've gotten really really tired of authors who ought to know better switching POVs just to create forced suspense (i.e. having one character get jumped in an ally and then switching to the other POV character, leaving you wondering if the first one will get out of the horrible situation.) Jim Butcher never uses that cheap trick in the whole 640 page book, because he builds suspense with his impressive storytelling. The next thing is that The Cinder Spires series has a rich beautiful world, but Jim Butcher never felt the need to do any info dumping. He feeds us just the right amount of information to allow us to understand the world, while still wondering about the history of the world. And I'm already anxious for the next book so I can learn more about the world. I could continue to go on about Jim Butcher's writing craft, but I should probably get to the actual review of the story. Not only has Jim Butcher created an amazing world, but he's filled it with great characters, and with 640 pages he's given us plenty of time to get to know them and love them. However, a great world and lifelike characters don't make novel, so Jim Butcher polishes it all off with great storytelling. The Cinder Spires series takes place in a world where everyone lives on spires because the ground is covered in dangerous, deadly animals. This means the only way of safely getting from one spire to another is through the air. And this is where the series truly shines. They travel through the air on airships, but they aren't your typical steampunk blimps, but wooden or copper-clad steel boats. The reason that works are the magical crystals that power them. Huge crystals are used to power the ships and keep them afloat, while an ethersilk web is cast around the ship to move the ship along the etheric currents. In addition to the huge crystals, smaller ones are used to power cannons and hand weapons. From there Jim Butcher has created a whole society that is based around the production and use of these crystals and even people, etherealists, who have a rather unique relationship with the crystals themselves. Everything I've said so far is great, but what really made me love this book was Rowl. He's one of the POV characters, and he's a cat. I'm guessing a lot of people we'll be split on whether they love the talking cats or hate them. But I love any well written book with talking animals, so that was just the icing on the cake for me. 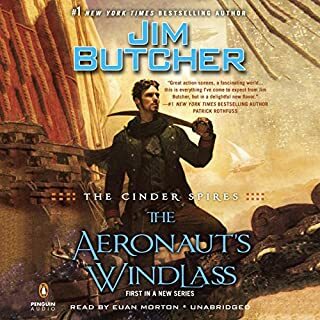 THE AERONAUT'S WINDLASS is an excellent book, and I highly recommend it, and now I don't know what I want to see more the next Dresden book or the next Cinder Spires book. I enjoyed it even more so then the first! 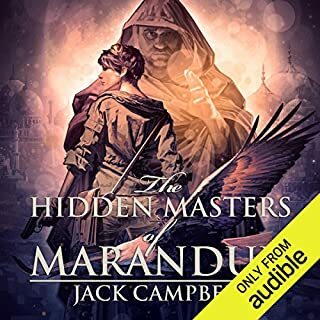 I may be a little biased because Jack Campbell is my favorite living author, but I loved THE HIDDEN MASTERS OF MARANDUR. This book picks up about two weeks after THE DRAGONS OF DORCASTLE ended, and you’re thrown right into the action. The intense battle and action scenes are one of the places where Campbell’s writing really shines. There are a lot of urban and epic fantasy novels that make me cringe when I read their battles, but Campbell’s years of military experience help him write realistic battles. Even though the battles are amazing, my favorite part of this book is the interaction between Mari and Alain. In the previous book, Alain and Mari only barely admitted their feelings to each other, so it’s great to see their friendship and relationship develop as they continue working together and saving each others’ lives. One of the things I loved the most about THE DRAGONS OF DORCASTLE was the fun and natural banter between Alain and Mari, and that banter is still in this book and maybe even a touch better. Though Alain is continuing to learn more about normal social interaction, he still makes slips every once in a while that will make you want to either laugh or put your head in your hands. While they’re relationship continues to grow, it’s also fun to watch their individual characters develop. They have to remove their guild related garb and don the clothes of commons, as they run from both of their guilds. This allows them to see the world through the eyes of the commons when they interact with commons on an equal level. They both work hard to throw off the false teachings of their guilds, as they see what the world is actually like. I love/hate cliffhangers just as much as anyone else, but Campbell hasn’t found the need for them yet in the Pillars of Reality series. Campbell ended THE HIDDEN MASTERS OF MARANDUR in a great place, where I’m dying to know what happened next, but without putting the characters in a life or death situation. I just have to hope the next installment comes out as quickly as THE HIDDEN MASTERS OF MARANDUR did. It will be an instant buy for me. Jack Campbell is in the process of getting the books in print, but until that happens the Pillars of Reality series is exclusively on Audible. And that’s okay because MacLeod Andrews does an amazing job narrating the series. MacLeod does an excellent job putting emotion into the banter between Alain and Mari, adding an extra layer of realism to the production. Spat out by the sea, the boy lay on the rocks, as still as death. Even if he survived the day, he had no home. No memory. And no name. So begins the tale of the strange young boy, who having washed up on the shores of ancient Wales, is determined to find his real home and his true name. One day he will become the greatest wizard of all time, but he knows nothing of this now. T.A. Baron writes like the classics of previous generations like Tolkien. So the series starts off rather slow, but once Merlin starts his journey there are lots of adventures in store. 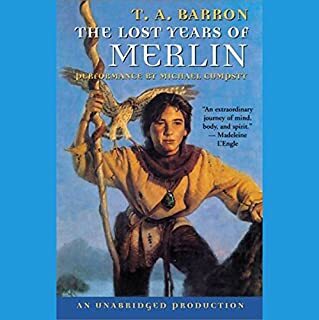 The first book in the Lost Years of Merlin series has lots of action and adventure once you get to about the halfway point in the book, but even then a lot of the book is still just building the world and setting the stage for the rest of the series. I love Shim! He is such a fun character, and of course there is the ever present Trouble is a lot of fun too. Also a lot of people complain about the narration, but I rather liked it. 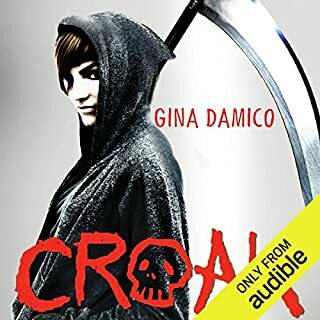 The Croak Series is great, and the first book starts off really strong. I love the characters in this series, and I'm constantly laughing at and with them. Damico has done an amazing job of crafting a rich fantasy world of Grims. So many authors build off of worlds that others have started, but Damico's world is unique and original. I also think that Damico does a great job discussing the moral dilemmas that Lex goes through as she is introduced to the Grim Sphere and learns just who she is and what she has to do. The Valkyrie Kara stood alone against the Ragnarok horde on Earth to ensure that the Asgard race and Valhalla could escape. For 5,000 years she has fought and evaded the Ragnarok race on Earth, just waiting for her people to return. A human woman, Kate, joins her fight, showing as much conviction and valor as any Valkyrie. Their friendship quickly becomes something more as they hold the line on Earth in battle, to herald the return of the Asgard. 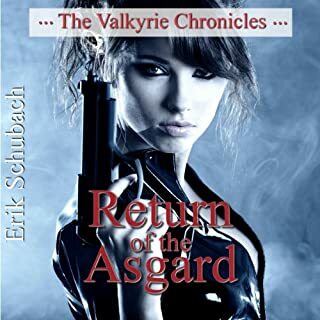 Schubach takes the classic Norse mythology and twists it. Instead of the gods of Valhalla we have an alien race. Instead of the Valkyrie and the Einherjar preparing for an event called Ragnarok, they are fighting other aliens called Ragnarok. In the story the ancient norse mythology was actually all started by Kara, the main character, when she got drunk and told the tales of her people to a group of vikings. Though all the characters are a little larger than life, since they are super old and powerful aliens, they all still feel real. And Schubach adds plenty of humor into his books too that make the characters feel that much more real. I absolutely loved this book and the series just gets better with each book. I highly recommend it.